Do you want to expunge your Maryland record online? Are you looking for a service that allows you to complete the online expungement process in Maryland? The easiest way to expunge your record in Maryland online is through MarylandExpungement.com. Click here to get started expunging your record online in Maryland with a FREE expungement eligibility test. MarylandExpungement.com is a online expungement service in Maryland owned and offering legal expungement by the Law Offices of Randolph Rice. Online expungement is only available through Maryland expungement.com and not offered by a State or government website. 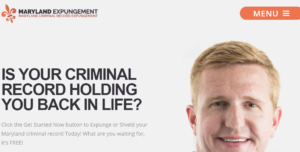 This legal expungement service is particularly convenient for individuals who don’t want to have to travel to the courthouse, obtain all the paperwork, drive home. Then try to fill out the complicated paperwork and multiple forms, not knowing which form is correct. Then having to file the forms with the proper courthouse and paying appropriate court fees. And remember, if you make a mistake you don’t get back your filing fee to the court. In other words, the fees are non-refundable if you make a mistake. So why not make sure you do it right the first time with it an online service that does everything for you. MarylandExpungement.com is a simple online expungement service that can take you a few minutes to complete the process. Start by visiting the site and and clicking on “get started now.” All you have to do is answer a few simple questions about yourself and background and their Maryland expungement lawyers will do the rest. That’s it, the next step is let the lawyers take care of the expungement paperwork and you sit back and relax while your case is handled properly and efficiently, all online. Everything is done online experience and processed by experienced Maryland expungement lawyers. Filing your expungement online in Maryland couldn’t be easier with MarylandExpungement.com. Check out the website today and learn how you can have your Maryland criminal record expunged online today. Once you complete the intake eligibility test, pay a flat fee and the expungement lawyers will do the rest. File your expungement in Maryland online today and clean up that criminal record from the past.